Six-a-side cricket is the quickest, most fun-filled version of the glorious old game - a feast of world class players, thrilling matches, huge hits and spectacular catches. 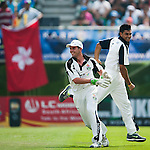 The Hong Kong Cricket Sixes is the longest-running, best-established and most high-profile sixes tournament in the world. It offers two days of fast and furious action in a festival atmosphere - 8 international teams, 45-minute clashes, global TV coverage and thousands of dollars in prize money up for grabs. First played in 1992, the tournament is fully sanctioned by the International Cricket Council and backed by the boards of the test-playing nations. Stars who have taken part include Brian Lara, Sachin Tendulkar, Steve and Mark Waugh, Viv Richards, Andrew Flintoff, Adam Gilchrist and Wasim Akram.